I’m going to make this one rather short and let the pictures to most of the talking. But Tuesday night, despite the Dodgers losing (and eventually getting swept by the D-Backs) was memorable. I met a bunch of new people who were all great to be around and with stories of motivation, perseverance, and dedication to weight loss and nutrition. We got to speak with Dodgers trainer Sue Falsone who was a great gal and a lot of fun (and also now follows me on Twitter). 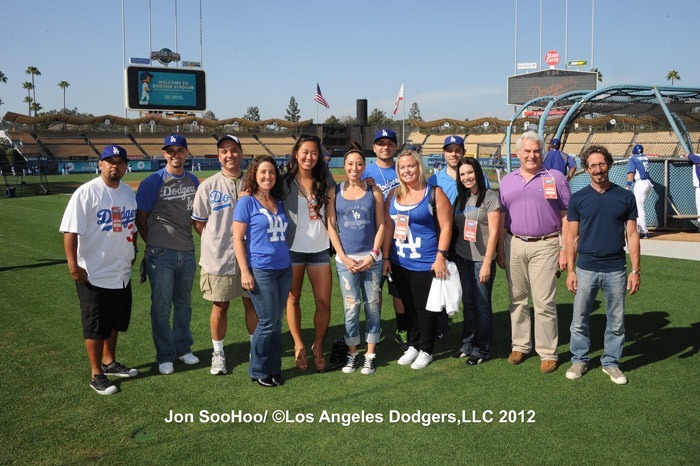 Photographer Jon SooHoo took a picture of the gang and jokingly told us to “Get the hell off of the grass!” after we were told to not go near it. Hey, he said we could, right? More of his pictures from that night are up on the Dodgers Photog Blog. I also got autographs from former Dodger players Don Newcombe and Sweet Lou Johnson as you will see later in this post. Both of them were very gracious. In short, it was a fantastic night and I would like to thank Josh Tucker, Dodgers Social Media Guru and host. He kept us all in line and ensured everything was taken care of. And a tip of the cap to the entire Dodger organization who once again were pure class. And without any further delay, the pictures. Panoramic of the field with Josh Tucker on the right. Click to enlarge. Me on the field. This is also my Facebook cover photo. Me and organist Nancy Bea. I only wish this image was a bit clearer. That guy…third from the left. I know him from somewhere…!